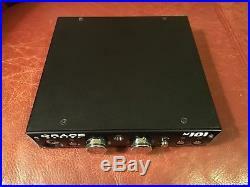 Single channel of ultra clean, ultra low noise mic preamp. 1-channel Microphone/Instrument Preamp with Balanced, Unbalanced, and Instrument Inputs. 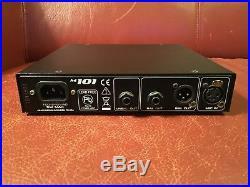 The Grace Design m101 mic pre represents a retooling of the hugely successful Model 101 mic pre. The m101's signal path incorporates 0.5% precision metal film resistors for optimal signal clarity. A 12-position gold-plated rotary gain switch with a higher performance output line driver and HPF amplifier are onboard. Also new on the m101 is ribbon mode, with plenty of gain and a relay bypass de-activating phantom power to protect your ribbon mics. The power supply is now built in, eliminating the wall wart with the m101. 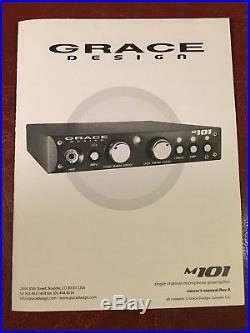 Grace Design Quality The Grace m101 is a single serving of the critically acclaimed Grace Design microphone preamplifier. The Grace m101 sports updated components inside and out. The former silver exterior has been replaced with a sleek black finish. The model m101 is also fully balanced and transformerless with no electrolytic capacitors in the signal path. There are 0.5% precision metal film resistors in the signal path and a 12-position gold plated rotary gain switch. With incredible bandwidth, headroom and resolution, the Grace m101 is remarkably natural, musical and detailed. Also, the Grace m101 is equipped with an extended gain range input (10-75dB)'Grace Designed' for gain-hungry ribbon microphones. Plug The Grace m101 In The included instrument DI input of the Grace m101 is designed to accommodate a wide variety of high impedance input sources, making the Grace m101 an excellent choice as a DI box which will flawlessly preserve the sound of the instrument - imagine the same resolution and detail as Grace microphone preamplifiers available for direct-inject recording situations. Rugged Grace Construction To top it off, the Grace Design m101 mic pre is completely rugged and road worthy, so discerning live performers can use the m101 to achieve studio quality sound with their live setups. The Grace m101 mic pre is rack mountable in a standard 1U rack tray, and two units will happily nest side by side in one rack space. Equally at home amplifying a vintage condenser mic or an acoustic guitar, the Grace model m101 delivers results previously available only to big budget studios and Grammy-winning engineers. The audio signal path incorporates 0.5% precision metal film resistors. 12-position gold plated rotary gain switch. Higher performance output line driver amplifier and HPF amplifier. Ribbon mic mode now included as standard - relay bypass of phantom power decoupling capacitors, increased input impedance and +48V lockout. Three output connectors: XLR balanced, 1/4" TRS balanced and 1/4" TS unbalanced. Sealed gold contact relay for hi-Z input switching. Built in, universal linear power supply (no more "wall wart"). LED indicators for +48V, ribbon mode and HPF. 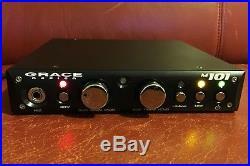 The item "Grace Design M101 Mic Preamp No Minimum, No Reserve" is in sale since Sunday, February 18, 2018. This item is in the category "Musical Instruments & Gear\Pro Audio Equipment\Preamps & Channel Strips". The seller is "prdurham" and is located in Bozeman, Montana. This item can be shipped to United States.